Children who receive one-on-one homeschooling will learn more than others, giving them an unfair advantage in the marketplace. This is undemocratic. You can wear pajamas to class and not get kicked out. Cartoon by Jim Erskine. To assure the quality and consistency of walking skills in forthcoming generations, it is anticipated that walking will soon be taught by professional teachers in properly equipped, educational facilities. Have you ever noticed that even the most intelligent seeming humans are capable of asking extremely annoying questions about homeschooling? Where seldom is heard, the hurry up word, and the van’s in the carport all day! Young homeschoolers, teen homeschoolers, parents and even curriculum suppliers are making videos and using YouTube. Tired of questions/comments about why you’re distinctly NOT starting school this week? Yearn to relate to the kids down the road? Here are a few joke suggestions. I’m writing this slow ’cause I know you can’t read fast. If I homeschool, will I have to wear Birkenstocks? If I homeschool, will I have to raise goats and chickens? Will I have to bake my own bread and sew all of our own clothes? by Rebecca Prewett. Homeschool conventioneer attempts to get his Dial bar of soap back. First, mom checks three books on electricity out of the library. Does it take to change a lightbulb? 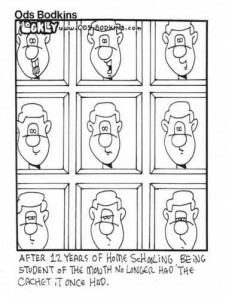 I have seen so many people try to discredit home education but fall short every time of really publishing the kind of rant that has most of us falling out of our chairs in fits of laughter. Links to other sites with homeschooling humor. Martha’s way #1: Stuff a miniature marshmallow in the bottom of a sugar cone to prevent ice cream drips. Why you may not want to use K12 for homeschooling your children. What do you call it when a homeschool mom talks to herself? Real Homeschool Mothers often have sticky floors, filthy ovens and happy kids. If you can’t find matching socks for your child first thing in the morning, who cares? I’m sorry, I didn’t hear you. I was mentally planning her week of Girl Scouts, 4-H, dance class, karate, and soccer. What were you saying about socialization? You’re the life of the party, even when it lasts until 8 p.m.
You get to change more than diapers, you get to change their minds. See also: Laughing at Ourselves for offsite homeschooling humor links.